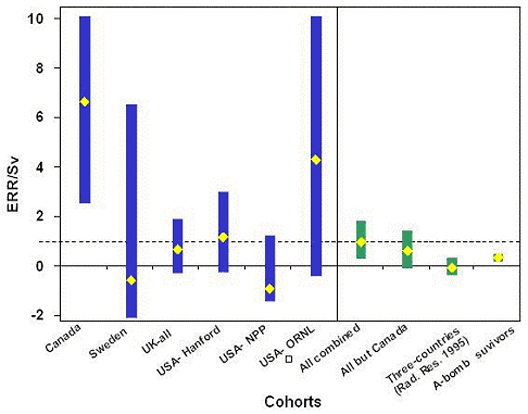 Dr. E. Cardis at International Agency for Research on Cancer (IARC), Lyon, and co-authors have recently published epidemiological (analytical) results on the potential effects of external radiation exposure on cohorts of workers in the nuclear industry in 15 countries(Table 1). This short report, entitled “Risk of cancer after low doses of ionizing radiation: retrospective cohort study in 15 countries” has been published in the British Medical Journal (BMJ). In this study, data/information submitted from Japan were included only in analyses of leukaemia. Data on the atomic bomb survivors in Hiroshima and Nagasaki were recalculated for comparison with the results of these analyses. (1) The excess relative risk (ERR) per Sv for all cancers excluding leukaemia was statistically significant, in contrast to the Canadian, UK and US joint research (published in 1995, ERR: -0.07/Sv, 90% confidence interval (CI): -0.39 to 0.30, hereinafter referred to as the “3-country research”). The central risk estimate based on the linear non-threshold (LNT) theory was 0.97/Sv (95%CI: 0.14-1.97) (Supplementary Figure 1, Table 2). For solid cancers, the ERR was 0.87 (95%CI: 0.03-1.88), which was higher than that for atomic bomb survivors (ERR: 0.32/Sv, 95%CI: 0.01-0.50). (2) The estimated ERR for leukaemia excluding chronic lymphocytic leukaemia (CLL) was 1.93/Sv (95%CI: <0 to 8.47) which was not statistically significant. This is in disagreement with the results of the 3-country research (ERR: 2.18/Sv, 90%CI: 0.13-5.7) and atomic bomb survivors´ data (ERR: 3.15/Sv, 95%CI: 1.58-5.67). However, it is consistent with the risk estimates derived from other previous studies (1-3). REA, on the basis of the following observations, deems these results and conclusions premature, and believes that one should not make a hasty judgment or interpretation that evident health effects by low-dose radiation have been found. The 15 country study, though based on the largest cohort ever examined, [much larger than the 3-country research (table 1)], showed decreased statistical power (i.e., wider range of confidence intervals) contrary to general expectations (table 2). This is likely to be due to the fact that nearly 60,000 workers with internal contamination or neutron exposures were excluded, though they have received relatively high doses. However, a study conducted by REA on a Japanese population indicated that cigarette smoking and alcohol consumption both increased in parallel with the cumulative doses, strongly suggesting the possibility of confounding effects (for further details, see this report.). The IARC article states that “no evidence for differences in risk between…, cohorts,…” was evident. However, analyses excluding one country (or cohort) at a time produced ERR per Sv of 0.58 (95%CI: -0.22 to 1.55), which was no longer significantly different from zero, only when Canada was excluded. It is possible that the data from Canada, which were particularly in the higher range, have affected and shifted the overall results. Although the present multi-national joint research undertook a multitude of analyses under varying conditions, it only made public the results of the analysis exclusively based on one set of conditions from which the conclusions were drawn. According to common practice, such studies should draw conclusions by comparing the results obtained under differing analytical conditions, and these results should also be disclosed for review by experts. It is indeed regrettable that the article has been published in such a way that the public has little accessibility to more detailed information of the study. The data need to have sufficient inter-relatedness. Events observed in a particular population are also observable in other similar populations. Exposure is demonstrated to have occurred prior to the onset of the disease. Epidemiological observations are compatible with, or relevant to, existing biological knowledge/theories. The higher the cumulative doses are, either the higher or the lower the cancer risks will be. The present IARC article provides, in comparison with other similar research on low-dose irradiation, an insufficient amount of data for determining the above-mentioned causal relationships. Appropriate consideration of the effects exerted on the results by the socioeconomic status (SES) indices reportedly used for stratification of the data is required. One study conducted in the US reported that the SES counted for at most approximately 3% of the overall cancer risk, which is one-tenth of the risk of cigarette smoking or adult diet/obesity, respectively; the significance of SES has been reported as fairly low(Supplementary Figure 2). Cohorts of workers excluded from the analyses of all cancers for whom socioeconomic information was unavailable or incomplete included approximately some 100,000 workers from Japan, Idaho National Engineering Laboratory (INEL), and Ontario Hydro Canada, leaving some 200,000 workers suitable for the analyses. The results of analyses incorporating these three excluded cohorts should be disclosed as well, since SES is unlikely to cause a significant difference to the mortality rates. The present IARC article contains no figure/table illustrating the relationship between the cumulative doses received and ERRs. Therefore, we cannot exclude the possibility that the published results of ERR per Sv had been largely influenced by exceptionally high values accidentally obtained only in a certain dose area, which caused the linear gradient to increase. (1) Cardis E, Gilbert ES, Carpenter L, Howe G, Kato I, Armstrong BK et al. Effects of low doses and low dose rates of external ionizing radiation: cancer mortality among nuclear industry workers in three countries. Radiat. Res. 1995; 142: 117-132. (2) IARC Study Group on Cancer Risk among Nuclear Industry Workers. Direct estimates of cancer mortality due to low doses of ionising radiation: an international study.. Lancet 1994; 344: 1039-1043. (3) Muirhead CR, Goodill AA, Haylock RGE, Vokes J, Little MP, Jackson DA et al. Occupational radiation exposure and mortality: Second analysis of the National Registry for radiation workers. J.Radiol. Prot. 1999; 19: 3-26. (4) Murata M, et al, Life-style and other characteristics of radiation workers at nuclear facilities in Japan: base-line date of a questionnaire survey. J. Epidemiol. 2002; 12: 310-319. Copyright (c) Radiation Effects Association All Rights Reserved.